Jenny Schulze an administrator with the Boys and Girls Club in Northern Utah shows one of the ornaments hidden throughout Logan, Brigham City and the Tremonton-Garland aree. The Boys and Girls Club of Northern Utah have decided to become angels bearing gifts this holiday season. They call their efforts “Mini Miracles.” The program was organized to help people throughout Cache and Box Elder counties have a little better Christmas. The organization works with 2000 youth from Kindergarten through 12th grade in the two counties. They have 18 to 20 staff members, most are part time volunteers. They have placed 12 blue Christmas ornaments with white interlocking hands on trees in Logan, Brigham City and the Tremonton-Garland area. Those ornaments, once found, can be exchanged for a Mini Miracle. 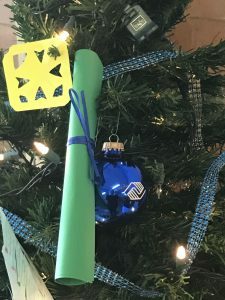 When people find them, they turn them in to the nearest Boys and Girls Club and fill out a form for someone they know that might need a boost for Christmas. The Brigham City office is located at the Brigham Clubhouse at 641 E. 200 N., Brigham City. The office in Tremonton/Garland is at the Community Resource Center at 450 S. 100 W. Garland and the office in Logan is at 106 N. Main. She said a little boy from Brigham City came in with the blue orb recently and asked for a cross necklace to give a family member who is having surgery. All of the ornaments are due by December 14 and the gifts will be delivered by club members on December 21. “We need the communities to work together and get the word out,” she said.